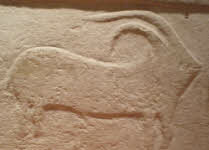 Whilst much of Malta's ancient culture is unique there are some elements at find echo in other widely distributed cultures from the Neolithic period, which dates between 3800 - 2500 bce. 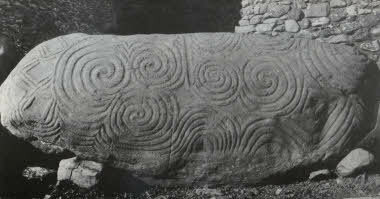 Mostly notably amongst them are the passage graves of Newgrange in Ireland and Gavrinis in Brittany. Examples of this are shown below. 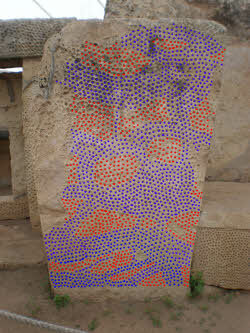 One of Malta's enigmas is the stone pitting design found in many of the temple sites. At first glance these markings might appear to be random but more careful inspection shows that this pitting design has patterns within it. Details of this are shown in the photographs below. Inspection of the above patterns shows arcs and curves that suggests deliberate design. The stones certainly have a hypnotic quality when gazed at for any period of time. 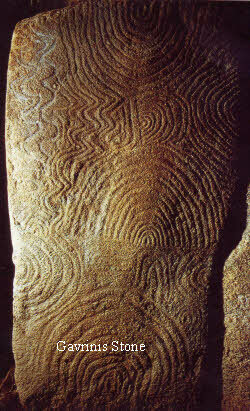 These markings can be compared with the stone carvings in Newgrange and Gavrinis shown below. 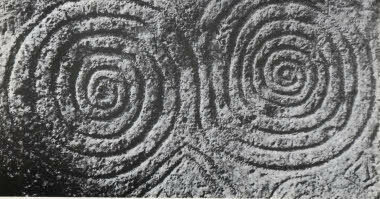 The stone on the left comes from Gavrinis in Brittany whilst the two stones on the right show rock art carving from Newgrange in Ireland. The pictures below show some of the stone artwork that has been discovered in Malta and now resides in the museum of archeology. 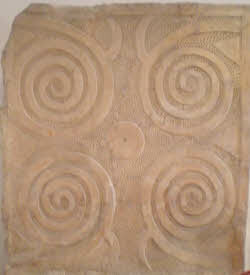 The designs above showing exquisitely carved spiral forms that makes up much ancient Malta's artwork. 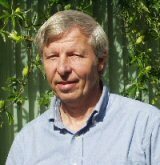 There is plenty of evidence to suggest that the Neolithic people's of the past were in communication along the whole of the eastern Atlantic seaboard and it is quite possible that Malta also formed part of the this culture network exchange for we find similar concepts in art, design and megalithic structures in the workings of these ancient peoples. 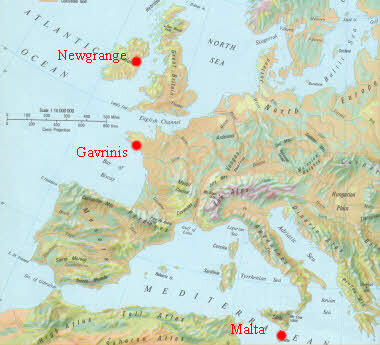 The map below shows the relationship between Malta and Gavrinis and Newgrange. The map on the left shows the relationship between Malta, in the Mediterranean, Gavrinis in Brittany and Newgrange in Ireland. These three sites are widely placed yet evidence suggests that that ideas were exchanged between these diverse cultures. Similarities in artistic design, the megalithic buildings and a fascination for alignments to specific solar seaonal events hints at this communication. Of all these cultures Malta gives us some of the best insights into the skills of our ancient forbears.